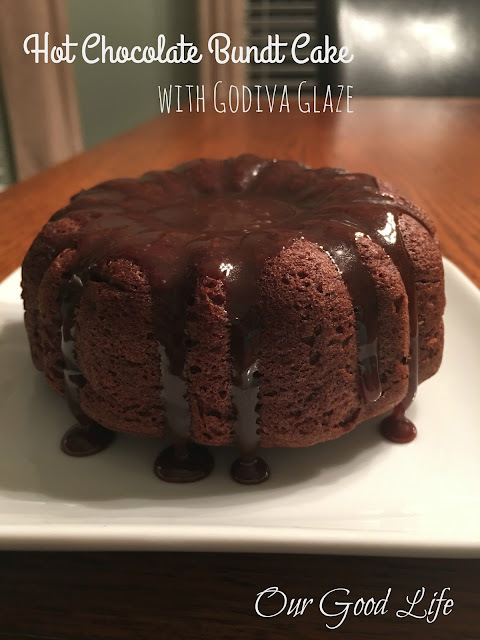 Look no further than this delicious hot chocolate bundt cake for your next dessert. Perfect for dinner parties, Valentine's Day, and every day eating! This month our lovely bakers at #BundtBakers have created some of the most decadent cakes with the theme of Hot Chocolate. Hot chocolate is my all time favorite drink. It is like getting a hug every time I have one. I get a lot of hugs! This cake is super simple and oh, so good. It is a great dessert to have at a winter party. The chocolate flavor on this cake is light which makes it different from a regular chocolate cake. Beat all ingredients together. Pour into a prepared mini bundt pan. Bake at 350 for 30 minutes. Test for doneness by inserting a cake tester into the cake. The cake tester should come out clean. Cool 10 minutes, remove from pan. Cool completely. Combine ingredients. Heat on stove until boiling. Cool 10 minutes. Pour over cooled cake.